The goals are to construct a prosthesis or prostheses for edentulous (toothless ) patient which are to fulfil the requirements of function (mastication) ,esthetics and phonetic within the limitations of existing intraoral condition , and associated structures. Standard dentures may fit comfortably and chew well, but are designed for the average patient using basic tooth shades and shapes. 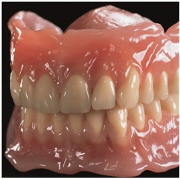 Every denture patient – especially those with oral tissues which have resorbed (shrunk) or those who have unusual jaw relationships (bite) – may require a personalized denture that utilizes premium materials and precision techniques. With premium personalized dentures, esthetics, comfort, fit and function combine to allow your smile to look more natural. Through the use of sophisticated instrumentation, from the impressions of your jaws to the specific jaw movements you make, all your facial information is recorded. Your Denturist is then able to recreate the character of your smile and restore the natural contour of your lips and facial muscles. Let your smile shine through!